and I update there daily. This livejournal is not going to be updated with any regularity, or possibly again ever, so for those who have been checking, please follow me over at tumblr! I will say this: there are all sorts of ways to be heroic, and just because Tessa works her mojo in a corset doesn't mean she's less of a badass. They're both badass girls. I think they would get along. Katniss: I like your corset. Tessa: And I am sure that your flaming jumpsuit is the very last word in fashion! Katniss: Boy do I hate being in a love triangle. Tessa: I can only most heartily agree. If Tessa wins this round, the last round of the Tournament will be Tessa vs. Clary. Which means that whoever wins that round, no matter what, you guys will get a brandnewsspeciallywrittenforyou scene. Terri Windling and her family have been coping with health and legal issues that have drained her financial resources at a critical time. Due to the serious nature of these issues, and privacy concerns for individual family members, we can't be more specific than that, but Terri is in need of our support. As a friend, a colleague and an inspiration, Terri has touched many, many lives over the years. She has been supremely generous in donating her own work and art to support friends and colleagues in crisis. Now, Terri is in need of some serious help from her community. Who better than her colleagues and fans to rise up to make some magick for her?" Basically I'm offering to write a short piece about your favorite TMI or ID character or pairing — canon, non-canon, I don't mind, though nothing too filthy :) and only characters from my own work. I'll handwrite it out and send it to you, framed if you'd like to keep it as a memento. The starting price is $50 — it's for a great cause and there's lots of other awesome stuff up for auction; check it out! * Technically these are ticketed events but only the pre-signing presentation is ticketed. You don't need tickets to show up and get your books signed, get the giveaway (signed copy of Magnus' Vow, tote backs, other cool stuff.) So just show up! Sophie and Tessa had been leaning against the door, ears pressed to the wood; at that moment, the door gave way, and swung open. Both straightened hastily, Tessa hoping that no evidence of their eavesdropping appeared on their faces. *Books sold by Fiction Addiction Bookstore. * This is the South Carolina event, so prepare to have your books stamped with a special stamp. And prepare for some very silly jokes. *If you have questions about the events, please contact the bookstore where the event will take place! If the event is an offsite, please contact the store selling the books, such as Fiction Addiction, or Politics and Prose. Hope to see you there! * * For those not sure what to expect from a book signing, the post by "Connie B." on this page is the best, most thorough description of it from the reader's viewpoint I've come across. 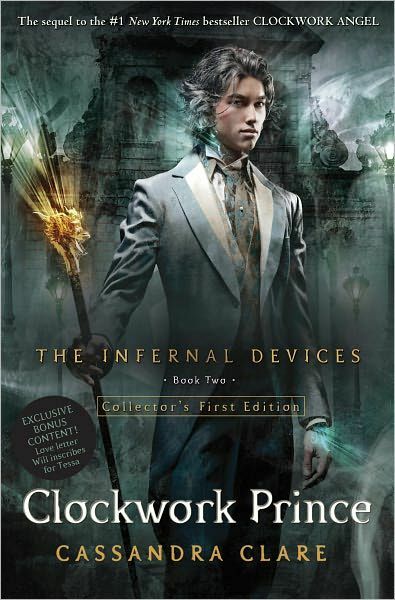 All print first editions of Clockwork Prince in North America, the UK/Ireland and Australia/NZ are going to come with a letter from Will to his family, that he never sent, in the back. That's *ALL FIRST EDITIONS." So ANY PRINT FIRST EDITION, WHEREVER you buy it, will have the letter. Indie stores, Barnes and Noble, etcetera. (I have asked about kindle/etc versions, but it looks like they won't have it.) You can tell the first edition because it says "collector's edition" on the front. * If you pre-order or buy within the first week or so, you will almost certainly get a first edition. It doesn't matter where you pre-order from. Beyond that I genuinely don't know how to tell you to ensure that you get one. Check the picture when you're ordering. If the cover says "SPECIAL COLLECTOR'S EDITION" that's a first edition. Walmart is also going to be carrying their own special edition, so more 411 on that when I get more information. Their special edition is going to be Jem-centric and you can get it from them either in the store or online. [Because no one expects anyone to buy more than one copy of the book, ALL THIS SPECIAL CONTENT WILL BE POSTED ONLINE AFTER AN EXCLUSIVITY PERIOD OF BETWEEN 3-6 MONTHS.] My advice, just pick whatever your favorite it and get that, or get a regular first edition and read the content online when the exclusivity period's up. *All these materials are being made available to international publishers and I will keep you updated as to how they will be available outside North America. Now first I just have to say I didn't know about this contest when I started my contest! I found out about it about halfway through but I didn't want to stop the contest while people were in the middle of drawing, photo-ing, vidding, and so forth — and the contest here was open internationally which the Goodreads contest is not. And the contest was so much fun for both people who entered and people who were just watching and admiring! It was great to see the outpouring of love and creativity, so thank you for that. I was quite surprised when S and S told me they were doing this giveaway with GR — there are such a limited quantity of ARCs, so aside from the ones set aside for sales accounts and specific reviewers, this is basically it. All the rest of the ARCs are up for grabs on Goodreads — all you need is a Goodreads account and to click "enter to win."